Ecuador 2019: Climbing the Volcanoes: Final Trip Report Does Ecuador Replace Nepal for Best 20,000-foot Climbs? Progress on K2 and Nanga Parbat feels stalled as the winter clock continues to advance. Teams are in their respective base camps either recovering from rotations or waiting for good weather. 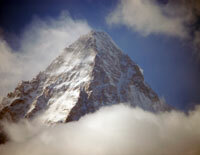 Injuries have taken six members thus far from the collective K2 efforts. The Kazakhstan, Russia and Kyrgyzstan team is back at K2 Base Camp resting up and passing time by spending 30 minutes each in a Gamo bag. They did a day trip to Advanced Base Camp, about 2 hours from normal BC, to check on the fixed line through the small Icefall – all was well. Apparently the news that four of the international team were hit by rock as “false new from Pakistain” according to message I received from Russian Climb. They had four members hit by rock or ice this past week requiring them to be evacuated to Skardu. They were Dmitry Muraviov from Kazakhstan, Konstantin Shepelin from Russia and Michael Danichkin from Kyrgyzstan. This leaves Artem Braun and Roman Abildae from Russia, Tursunali Aubakirov and Vassiliy Pivtsov both from Kazakhstan still climbing. Every step counts and we need to be sure in what we do. I think that in the last two expeditions on Everest, we equipped with ropes too early, and as the good weather did not arrive, we waste our energy re-equipping the track again and again after the strong storm. For that reason, and to be able to be strong and ready when the good weather arrives, we do not want to run, we need to listen to the mountain! I think that after equipping with ropes until Camp 2 in just two days, the mountain as well needs some days to rest until the good weather allows us to equip up to Camp 4. The forecast will tell us when to put the crampons on and climb towards one of the most beautiful mountains in the world. They have also had evacuation and injuries. Jon Barredo and Eva Robles from Spain plus Waldemar Kovalevsky from Poland were all taken to Skardu. The NP team now has only two members since the local Pakistani climbers ended their effort due to hardships and deep snow. The team of Daniele Nardi, British Thomas Ballard continue to climb. They had established Camp 3 at 5,714m with a cache of gear but upon their return found their tents blown away with no trace. Now they are back investigating the situation at C2. Expect go/no go decision soon. They are attempting the Mummery’s Spur. As usual with any big mountain winter climb, it comes down to weather. Both K2 and NB are playing tough and the winter clocks keeps ticking. On K2, it feels odd that the two teams have not joined forces – after all both have incredibly strong and experienced climbers – but politics on the mountain is always a strange beast.